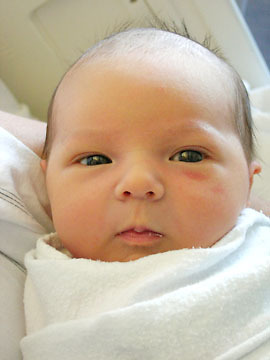 Wally and I are thrilled to announce that Elly Claire was born on Wednesday, November 9th at 9:28 pm. 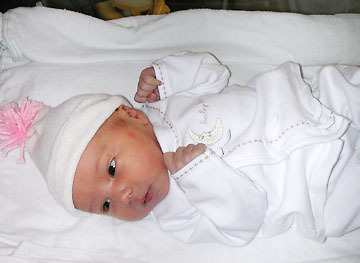 She weighed 7 pounds, 11 ounces and was 19 inches long. We came home from the hospital yesterday and are all doing well. Here are a few pictures of our new bundle of joy! We are happy to announce that our son Kai Alexander was born on April 22 at 2:00 am. He was a healthy 6 lbs., 15 oz. and 18 inches. Maya and Parker are enthralled with their new baby brother. Mom and Dad are ecstatic that he is a perfectly healthy, beautiful and mellow child. We cant wait to see you all and introduce you in person to Kai. 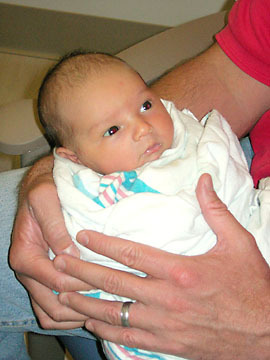 Today, April 22, 2004, Melisa Lauer gave birth to Kai Alexander Lauer, a healthy 6 pound 15 ounce boy. Mother and son are doing extremely well. A reliable source says Kai looks like his maternal grandfather, something everyone is convinced hell overcome. Kais older siblings, Parker (above) and Maya (below). Kevin has been promoted to detective with the Burlingame Police Dept. Lane is still working with the real estate software company and traveling all over the country teaching clients how to use it. Anthony is now in high school. But their biggest news is that they bought their first house (in San Mateo) and are currently moving in. Grandpa, Ann, Aunty Dorothy (Grandpas sister), Joan, Dad, Uncle Zute (Shizuto Kadota), Grandma and Mrs. Kadota. Uncle Zute, Joan, Aunty Dorothy, Grandpa, Ann, Grandma, Dad at Waimea Canyon. At Kevins wedding. Joan, Aunty Irene, Jody, Ann, Ron, Kathy, Bob, Karl and Kaitlyn. If you have Adobe Acrobat Reader and the browser plug-in, click on the picture to read a very nice article, in PDF (Adobe Acrobat portable document format), about Ken, published on September 4, 1998, in the Hawaii Herald. If you do not have Acrobat Reader, or would like to see the article as a Web page, please click here.